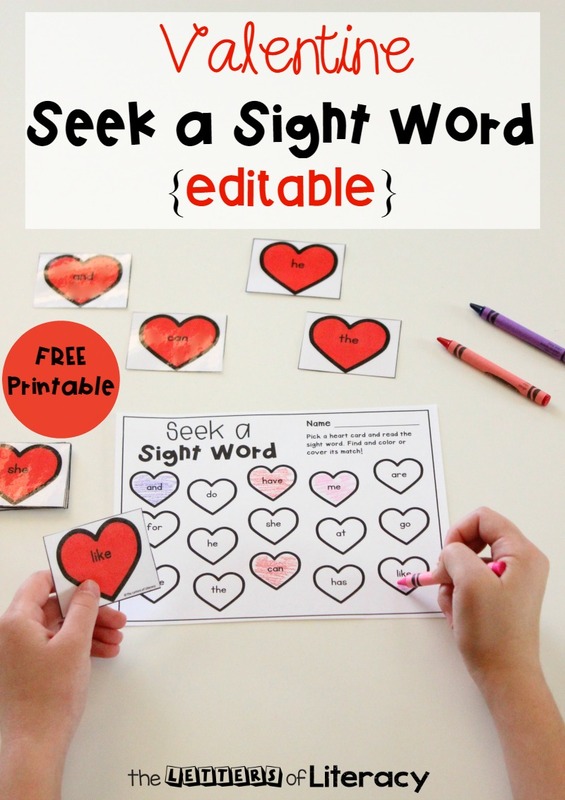 FREE Editable Sight Word Game for Valentine's Day for Primary Grades! There’s nothing better than a Valentine-themed literacy activity to get your children excited about practicing sight words! When there’s love, joy and red hearts all around this month, add more fun with this Editable Sight Word Game for Valentine’s Day! There are a few variations to this editable literacy activity that I know you are going to want to see. Put away the flashcards because this sight word activity is the perfect hands-on tool for children to practice spelling words in a whole new way! This activity is suitable for Pre-K to first grade students. You can use this in your homeschool or traditional classroom setting. Since this printable is editable, you can choose any 15 words that you’d like your students to focus on. You simply type them on the custom word generator page – and it will auto-populate the hearts and recording sheet for you! This editable activity is complete with “seek a sight word” recording sheet and 15 heart word cards customized by you! Hop on over to The Letters of Literacy to see my guest post and grab our FREE Editable Sight Word Game for Valentine’s Day!